Rich in history and culture, Granada is arguably one of Spain’s most compelling cities. 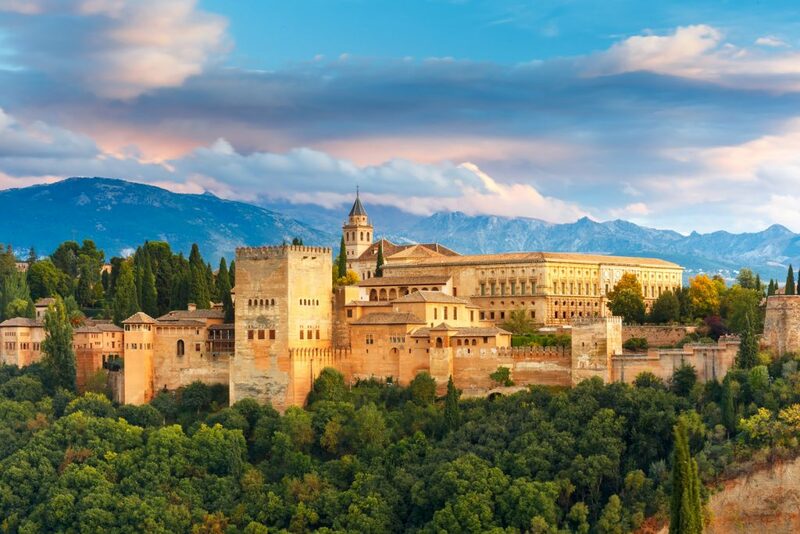 Ruled by the Moors for over 800 years, this gem is world famous for its Alhambra Palace, a walled fortress that is one of the country’s most breathtaking pieces of architecture. 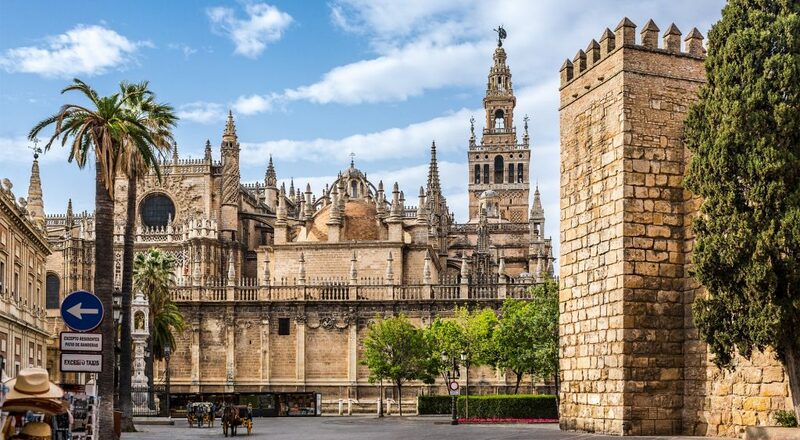 Seville, on the other hand, has been voted one of the globe’s Top 10 cities to visit. It’s romantic. It’s passionate. There’s no wonder why it’s the capitol of flamenco and one of the most loved by travelers in Europe. But, wait! Seville has an added bonus….it is very near Sherry wine country. Morning: Those who are coming with Wine-Knows to Mallorca on the pre-trip segment, will arrive late morning by airplane. Others have the morning free (it is strongly advised, however, that you arrive the day before to allow time for adjusting to jet lag, and to avoid any missed connection with the group). Afternoon: The trip begins with a visit to the spectacular medieval Alhambra Palace. 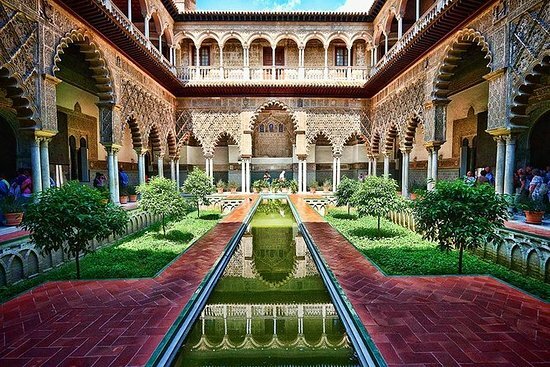 Known for its sophisticated architectural planning and complex Moorish decoration, the palace is a jewel box for all of the senses and one structure you will surely never forget. Evening: Tonight we’ll dine on the area’s Andalusian specialties…the most famous of which is gazpacho. Grilled meats and seafood will also be featured. Morning: Today we’ll enjoy a walking tour of the most ancient part of Granada. The old Moorish Quarter has been declared by the United Nations as a cultural World Heritage Site and is now under the protection of UNESCO. Afternoon: Enjoy this beautiful city on your own. Wander, shop or chill at one of the many sidewalk cafes or wine bars. Evening: Tonight we’ll feast on tapas and Spain’s superb cava, blanco and tinto wines as we visit Granada’s finest tapas bars. Morning: It will be difficult to leave Granada but there’s another charming city that awaits you, Seville! First, however, we’ll travel toward the Mediterranean near the Straits of Gibraltar to visit the legendary area where Sherry is made. 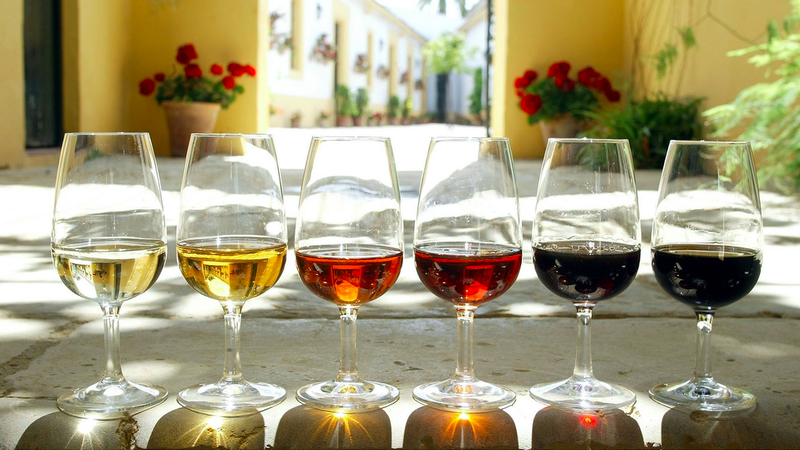 Afternoon: Private tasting at one of Sherry’s most esteemed producers of wine where we’ll learn how sherry’s vinification process differs from regular wine, but we’ll also taste a variety of Sherrys made in different styles for different foods. Late afternoon we’ll check into our hotel in the historical center of Seville. Evening: Tonight we’ll celebrate at one of the city’s top restaurants. Morning: Today we’ll head to Seville’s most famous market for a tour with a local chef. Then, with the chef we’ll cook a lunch of regional dishes made from the ingredients purchased. Afternoon: Next, we have a private tour of the stupendous cathedral. Awe-inspiring in its scale and majesty, this church also houses the tomb of Christopher Columbus. Afternoon: Today we’ll have a private tour of the stupendous Alcazar. This palace is one of the oldest royal residences still in use in the world. 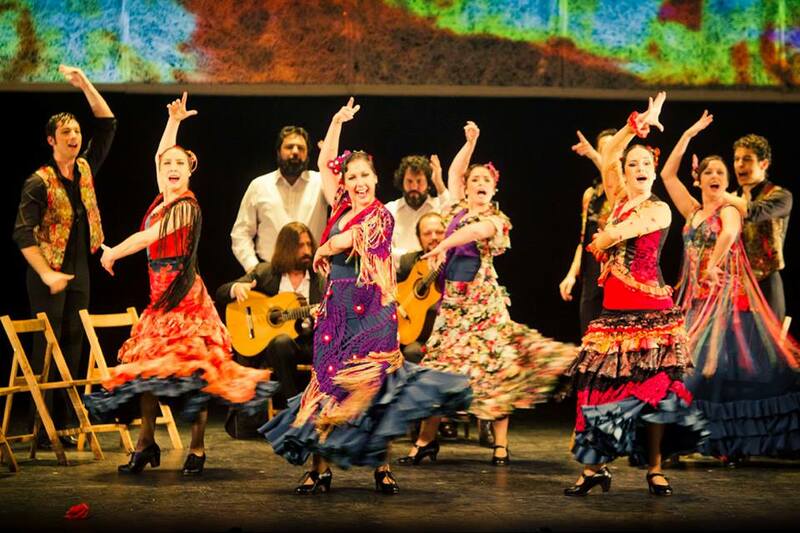 Evening: Seville is the birthplace of Flamenco so there’s no better way to commemorate our last night than to dine at a renowned Flamenco theater. Olé! 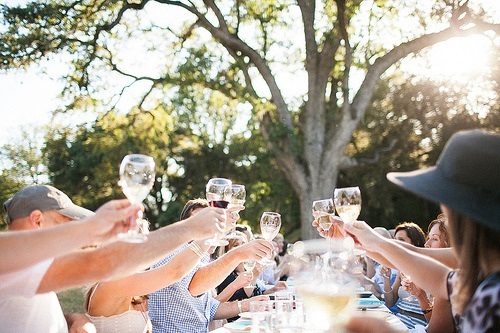 A toast good-bye to our new-found friends! Morning: The tour officially ends after breakfast. Wine-Knows will be happy to assist with post-trip plans. International group airfare has purposefully not been included to allow maximum flexibility in arrival & departure options. You may go early & stay over after the trip concludes. One of the hallmarks of the WineKnows’ brand is seeking out those oh-so-special spots to stay. We look for historical properties that ooze Old World charm, but offer the latest in 21st century creature comforts. Hotels will be finalized in June 2019 after our on premise inspections of several 4 and 5 star properties. The accommodations will be listed on the website the summer of 2019. Dining experiences have been mindfully selected. Dinners will range from sophisticated restaurants to a the best tapas bars. A visit with a chef to Seville’s most famous market has been included, followed by a cooking class. Participants must in good physical health and be able to keep up with the pace of the group. The tour often requires climbing two or more flights of stairs, walking distances of up to 3/4 mile (1200 meters) at a moderate gait, and negotiating cobble-stone streets and other irregular surfaces including dirt, gravel and/or wet surfaces. The tour will be business casual. Both Granada and Seville are replete with cobblestone streets, thus a pair of supportive walking shoes will be essential. Early October in southern Spain averages 70-80 degrees. The price is based upon double occupancy. Should you wish to share a room, every attempt will be made to find you a roommate (most of the time we have been quite successful in doing so), however if we are unable to find you a roommate, you will need to pay the single supplement of $795 US. A Deposit of $1200.00 US is due at the time of booking. A second installment payment of $1000.00 US is due by February 2, 2020. The third installment of $1000 is due by November 1, 2020. A non refundable fee of $250.00 US, applies for all cancellations.